The work looks at how three dimensional form comes to be and how it is experienced. The drawings and installations use lines, in two and three dimensions, to create form. The work is emergent rather than figurative or illustrative, and develops through the use of structural systems. One of these systems, Dendrites, is explained below. The structures can be produced across dimensions and scales: from a single mark on a page to a room filled with complicated form; the development over time and within a space is also often made evident. The focus of the work is on process, which develops directly from the structural capabilities of materials and in response to space, and on aspects such as scale, growth, depth and emergence. 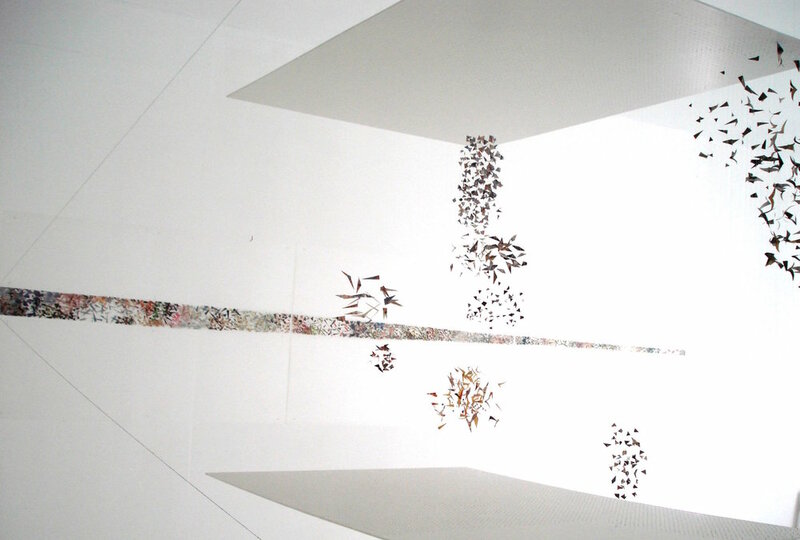 The drawings and installations combine to bring a wider focus to the work, across dimensions. The work has led to discussions about connections with many other disciplines, including physics, maths and engineering. This in turn led to my co-founding and running a talks organisation - ideas-matter-sphere - from 2011 to 2015, as well as an ongoing series of multi-disciplinary groups. These bring together practitioners to share ideas which develop independently yet which have points of connection. Two systems are used to create the three dimensional forms - Dendrites and Columns. This is a summary of the development of the Dendrites system. Step 2: Working with the photo of an individual cluster (paper fragments suspended on filament), lines were drawn to emphasise and extend the outlines of the shapes into space, to challenge what was actually being seen. Step 3: The structure of the drawn lines were translated back into three dimensions, using filament strung inside an open steel cube. Intersections were defined with ink to bring form back into the structure. The construction method involved individual Y-shaped threads forms, which became the building blocks for the Dendrite system. Step 4:. Once scaled up, the Dendrite system could be used to create installations which were versatile and responsive to complicated spaces. The system allowed the process and experience of incremental development to be shared with the audience. Development time was flexible: Colloquium completed in 1 day, Madame Lillies (illustrated here) spanned 10 days. Step 6: Echo Chamber focused on emergence and identity. Once the underlying dendrite structure of white thread was complete, selected lines were painted red. The ‘form’ which emerged instantly became visually dominant and defined the work.